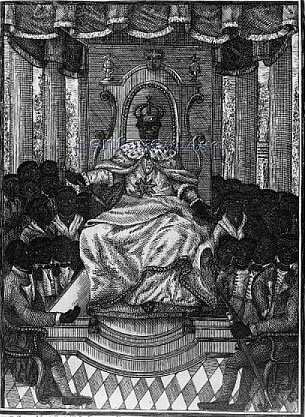 In 1802, Napoleon Bonaparte, to re-conquer the colony, deposed Toussaint L'Ouverture and declared his intention to reintroduce slavery which was earlier abolished by the French National Convention in 1794. As a consequence, Dessalines and other black and mulatto leaders rose in rebellion. After the fall of Toussaint L'Ouverture, Dessalines assumed the post of Commander in Chief of the Haitian Army. Dessalines was a formidable general, great strategist, master tactician, ruthless leader and unforgiving commander. Dessalines was illiterate, but a quick learner and for his ferocity in battle, he earned a nickname "the tiger". His initial goal was to free all slaves on the island, but over time the goal became total independence. On January 1, 1804, his force expelled the French from Saint-Domingue. Dessalines, as the governor-general, proclaimed the entire island of Hispaniola an independent country under the Arawak-derived name Haiti. In the following September (1804), he adopted the title of emperor as "Jacques I". He was crowned Emperor Jacques I in a coronation ceremony on 6 October in the city of Le Cap. To prevent white dominance, he confiscated land owned by white people, and between February and April, 1804, Dessalines ordered the deaths of approximately 3,000 to 5,000 white people of all ages and genders. On October 17, 1806, Dessalines was assassinated in the north of Port-au-Prince at Pont Larnage, (now known as Pont-Rouge) en route to battle the rebels. the text gives two different place of birth for the Emperor.